Three stainless steel layers. Four Kevlar reinforced layers. Wow. OTTOLOCK is designed to be a lightweight solution to secure your bike, kayak, or gear for a short period of time. 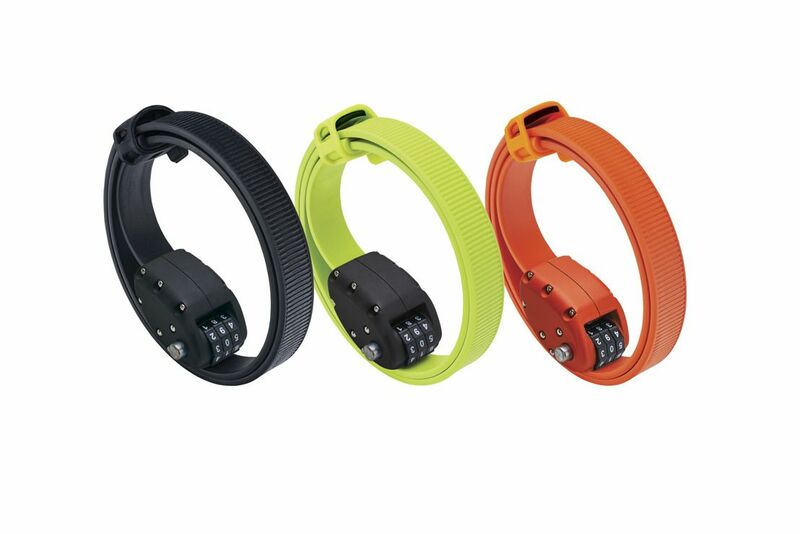 The flexible band has a rubber-like coating that keeps it from scratching your bike and curls up into a compact 3 inch diameter, small enough to fit into a jacket pocket. It’s available in 3 sizes: 18”, weighing 140g; 30”, weighing 175g; and 60”, weighing 255g. The locking mechanism is aluminum with three circular numbered dials which can be reset to any combination you choose. It’s more secure than a cable lock though not quite as secure as a U-Lock but much lighter than a U-Lock. Choose from 4 colorways: Stealth Black, Flash Green, OTTO Orange, and Camo. For quick pit-stops, go with the lightweight, secure, sleek, ultracompact OTTOLOCK!